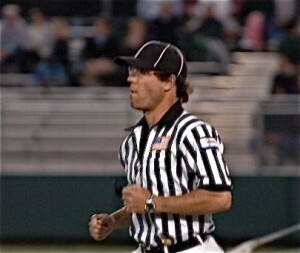 Greg Simon was posthumously inducted into the 2011 Class of the NorCal Lacrosse Hall of Fame in 2014. The following passage was written and shared at his induction by long-time friend and fellow referee, Gary Alabaster. Simo’s wife, Heidi Locke Simon, accepted his award. Finally, but most importantly, Simo was a loving husband to Heidi, a caring father to his daughter, Macquarie Amiela, and a great friend to lacrosse players, coaches and officials everywhere, but particularly in Northern California. To those of us who knew him well, his most obvious attribute was his huge heart. No matter the situation, Simo’s reaction would come from his heart. His generosity of spirit and the warmness of his friendship cannot be overstated. There isn’t anyone else like him.Although we will always smile when we think of Simo and the huge contributions he made, the smiles will be tinged with sadness because he will be sadly missed and no one will ever take his place. 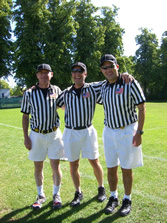 To honor the many contributions that Simo made to lacrosse in Northern California, and to help ensure that he will never be forgotten and that his attitude and approach to officiating will live on, the Northern California Lacrosse Referees Association has created The Simo “No Worries” Achievement Award for Outstanding Officiating .